It will be our unit box. Included in red is a line one-inch long. That red line would be a foot long at full size. At one-fourth actual size, we can add a 5,000-unit box. And a 10,000 unit box. At full size, it would be one meter to a side. Now would be a convenient time to zoom out to one-tenth actual size. We've added a 100,000-unit box. At full size, the red line included would be about the height of the average adult male. Our one-unit box is still barely visible all the way in the top-left corner. At one-thirtieth of actual size, here's a one-million-unit box. At this point, it's not even worth including the one-unit box. At full size, the red line here would be about the length of the average London bus. At 1/100 of actual size, here's a ten-million-unit box. Below it is an image, on the same scale, of a blue whale, the world's largest animal. Here's a billion-unit box, shown at 1/1000 of actual size. And here, at a scale of 1/5000, is a ten-billion unit box. At full size, the line to the right would be about the height of the Empire State Building. Zooming out again to 1/100,000; here's a trillion-unit box. At full size, this would be more than six miles to a side. 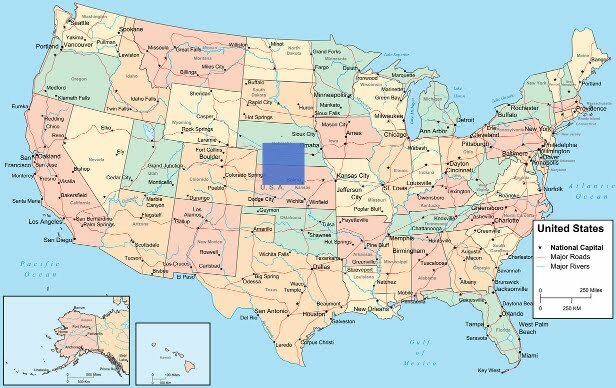 Here's a quadrillion-unit box relative to the continental united states. If you look closely, you can see our trillion-unit box directly above it. Yes, that is our state-sized quadrillion-unit box above it. But why stop here? 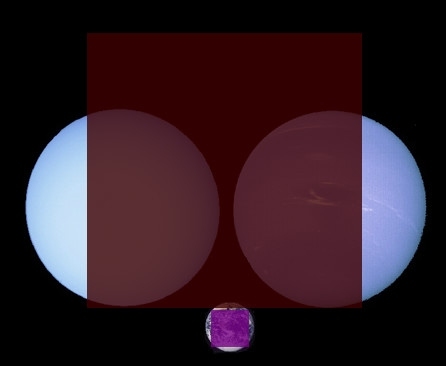 Here's a fifty-quintillion-unit box compared to Uranus and Neptune. 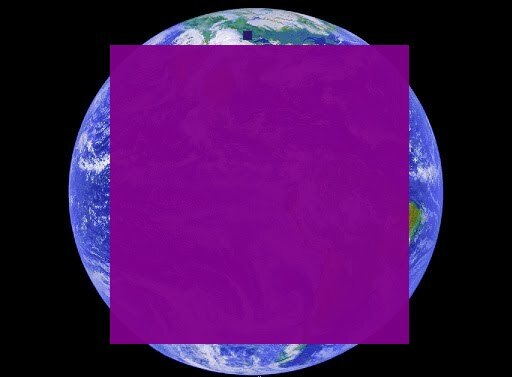 The earth, complete with our quintillion-unit box and our now-barely-visible quadrillion-unit box, is positioned below it. And there's really no reason to stop here either. 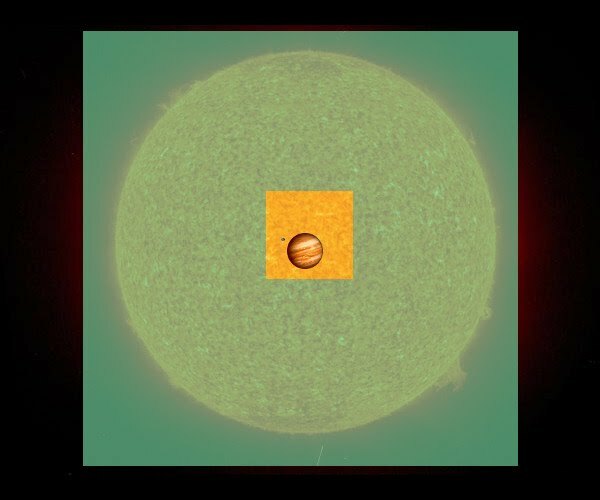 Here's a one-hundred-quintillion square centimeter box- about 2/3 of the Jovian cross section (Sbiis Saibian has called this number the Guppy). In the top left corner are our fifty-quintillion and one-quintillion boxes. 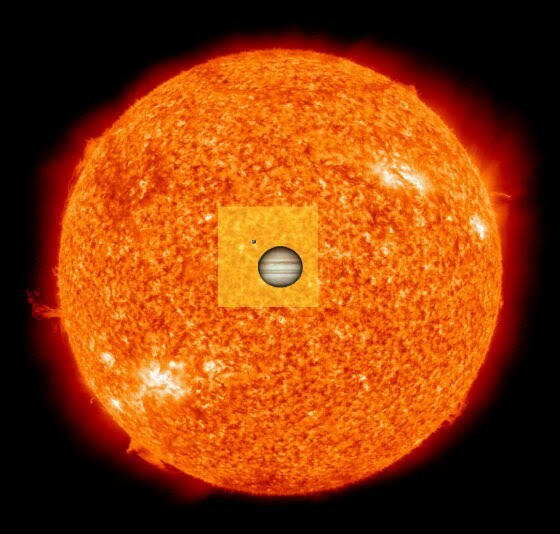 Moving right along, here's our sextillion-unit box compared to the sun. Jupiter and Earth are both included for comparison- though you could easily fit a layer of about 615 earths on it. And here's one septillion square centimeters. 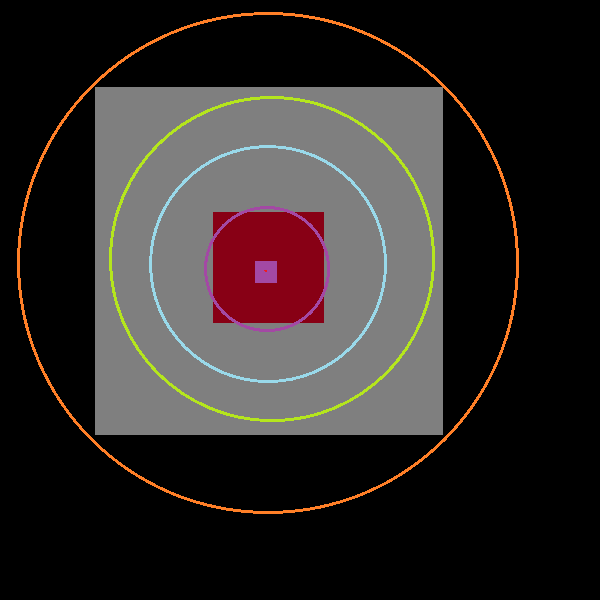 That orange dot at the center represents the sun, and the blue ring denotes the mean orbital distance of Mercury. 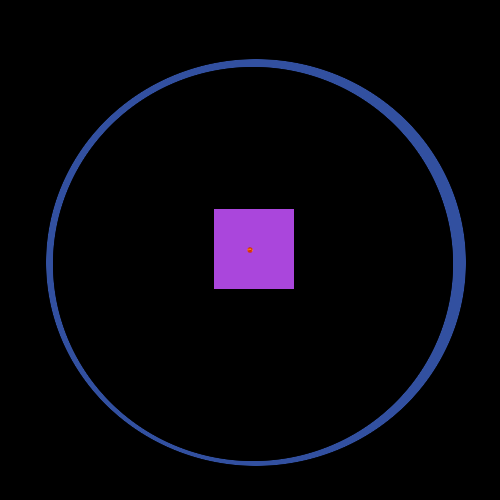 The below represents one hundred septillion square centimeters. The inner ring is, again, the orbit of mercury, and the outer ring is that of venus. 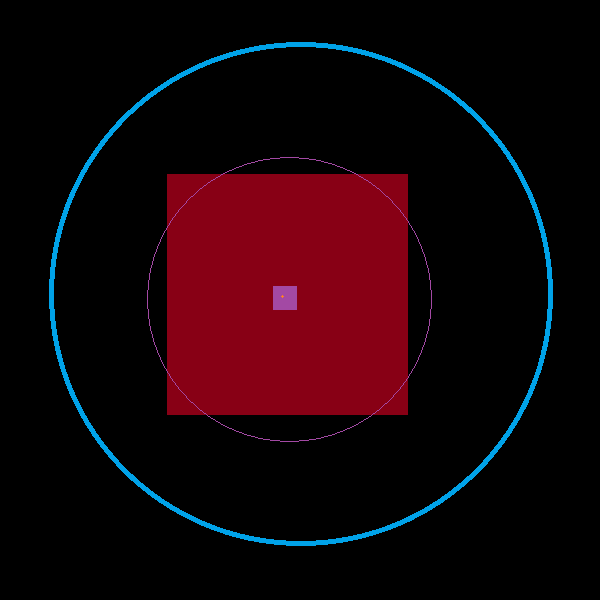 This next one represents 1 nonillion square centimeters. The maximum distance between Pluto and the sun will be less than the length of one of this monster's sides. 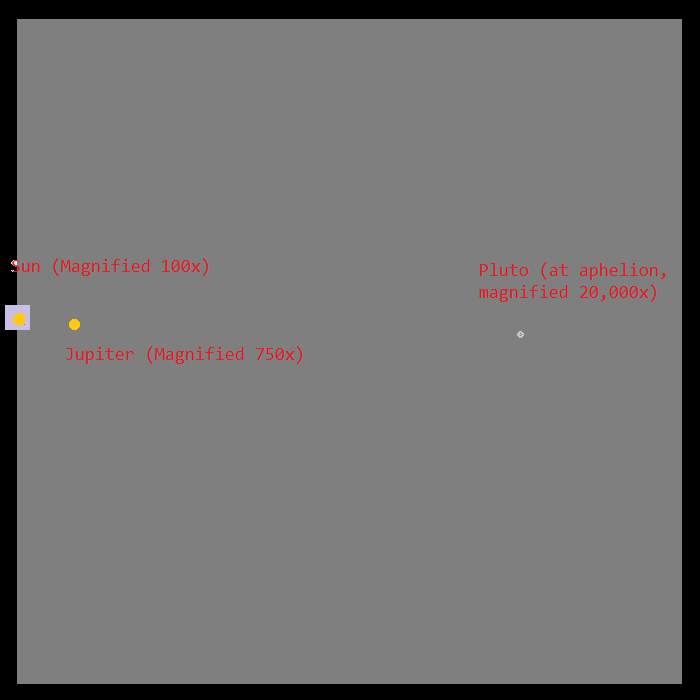 The distances are roughly to scale, as is our 1 octillion unit square, but it is important to note that the sizes of the other objects are no longer to scale.